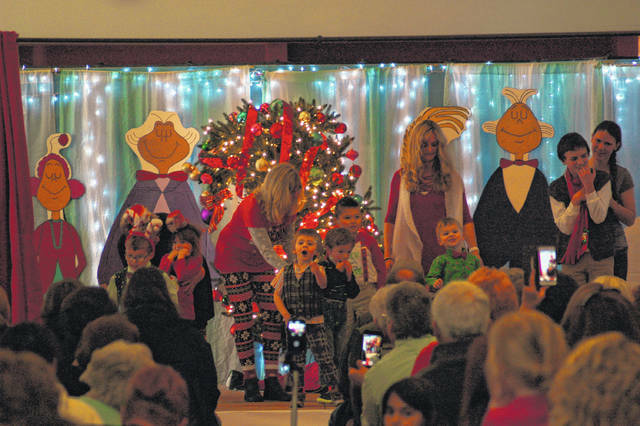 GALLIPOLIS — Families gathered together at Guiding Hand School Wednesday afternoon to witness their children participate in Christmas in Whoville. Students in the preschool and school-age programs participated in singing and dancing on stage to classic Christmas songs that told the story of the Grinch, who notoriously tried to steal Christmas in Dr. Suess’ classic children’s book. According to Suzanne Eachus, early childhood center director at Guiding Hand, the story of the Grinch and Whoville had excellent timing for them. Closing out the theatrical performance, the students and teachers lined up around the room holding hands singing “We Wish You A Merry Christmas,” a scene reminiscent of when the Grinch returned the gifts to Whoville after finding his heart. With the passing of the levy, Guiding Hand will be able to continue to provide services for students and families dealing with developmental delays and disabilities. Currently, Guiding Hand provides services for students in preschool and school age students. If the levy had not passed, the future of the school would’ve been in question, according to Eachus. This year six classes helped put on the Whoville show; three preschool and three school age classes.